Customized up to Lehenga: 40 & 42. Customized up to Choli : 40 & 42. Green phantom silk embroidered bridal lehengaLehenga Color: Teel Green. Blouse Color: Teel Green. Dupatta Color: Teel Green Color (Tread Work). Lehe.. PRODUCT FABRIC DETAILSLehenga Color: Cherry Red.Blouse Color: Teal Green.Dupatta Color: Mustard Orange.Lehenga Fabric: Phantom Silk.Blouse Fabric: Pha..
Lehenga DetailsColor: Ocean Green.Fabric: Phantom Silk.Flair Work: Copper Metailc Foil. Length: 42 inch. (41-XL•Stitched)Customized up to Lehenga.. PRODUCT FABRIC DETAILSLehenga Color: Cherry Red.Blouse Color: Cherry Red.Dupatta Color: Peach.Shawl Color: Peach.Lehenga Fabric: Nylon Satin.Blouse Fa..
Lehenga DetailsColor: Pista.Fabric: Thai Silk.Flair Work: Copper Metailc Foil.Length: 42 inch. 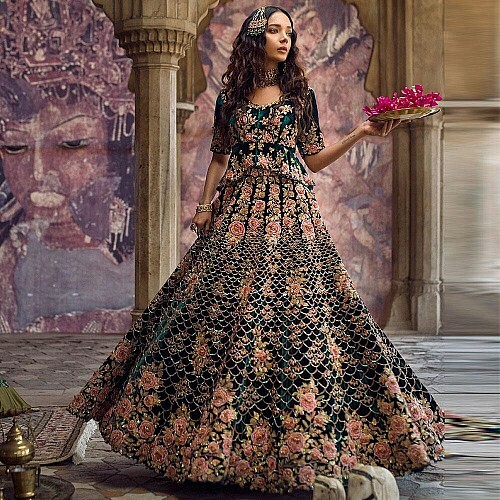 (42-XL • Stitched)Customized up to Lehenga: 40 &a.. PRODUCT FABRIC DETAILSLehenga Color: Black.Blouse Color: Teal Green.Dupatta Color: Maroon & Gold.Lehenga Fabric: Thai Silk.Blouse Fabric: Thai Sil..
Lehenga DetailsColor: Deep Ocean Blue.Fabric: Banarasi Silk.Flair Work: Heavy Embroidered Work. (Zari & Sequence & Resham Work)Length: 42 inch..
Lehenga DetailsColor: Pine Green.Fabric: Thai Silk.Flair Work: Heavy Embroidered Work. (Thread Zari & Sequence Work)Length: 42 inch. (Semi Stitche..
Lehenga DetailsFabric: bright banarasiFlair Work: embroidery.Length: 42 inch. (Semi Stitched)Customized up to Lehenga : 40 & 42.Choli Detail..